Duration 6 min (1st version: 4 min 30 sec). Commission / occasion Commissioned by the dance production Simultan Hommage à Sonia Delaunay (with 4 dancers and live music) at Skissernas museum (Museum of Sketches) in Lund (Swe). The main idea behind the piece is a compensation of complex extended playing posi­tions by a simple musical structure. Inspired by a collaboration with four professional dancers from the bal­let acade­my in Gothenburg/Sweden, the rhythmical development of this dance music is based on three traditional dance-like rhythms derived from the Sara­­bande, the Ca­priccio and the Toccata. A circul­ar rhythmical transformation process with the calm­ness of the Sara­bande as starting and ending point and the rather lively Capriccio and Toccata in the middle, corres­ponds to quite linear timbral transitions from tiny sweep­­ing sounds, to delicate whist­­ling sounds, to noisy distorted sounds at the gold­en section and back to sweep­­ing sounds. 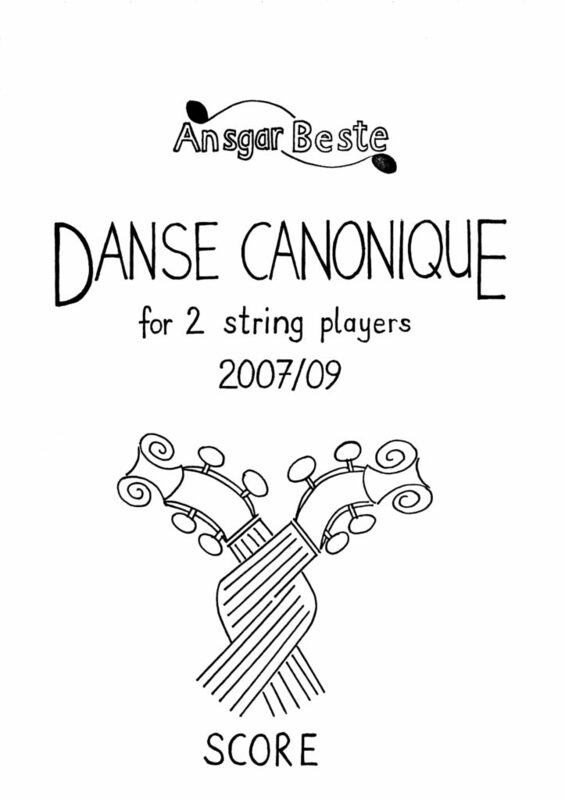 The players obtain all those sounds by constantly bowing on the string instruments with the hair of the bow, but by changing the playing positions and bowing charac­ter­ist­ics almost every measure. The resulting movements create a dance of the musi­cians around their instruments which might look like a “Follow the Leader game”, due to the strictly canonical behaviour of the rhythmical structure. For the audience, the compensation between playing position and musical structure consists of visual complexity versus auditive simplicity.